Couplings, clutches and gearboxes: The diesel engine is a type of internal combustion engine which ignites the fuel by injecting it into hot, high-pressure air in a combustion chamber. In common with all internal combustion engines the diesel engine operates with a fixed sequence of events, which may be achieved either in four strokes or two, a stroke being the travel of the piston between its extreme points. Each stroke is accomplished in half a revolution of the crankshaft. Where the shaft speed of a medium-speed diesel engine is not suitable for its application, e.g. where a low speed drive for a propeller is required, a gearbox must be provided. Between the engine and gearbox it is usual to fit some form of flexible coupling to dampen out vibrations. There is also often a need for a clutch to disconnect the engine from the gearbox. Elastic or flexible couplings allow slight misalignment and damp out or remove torque variations from the engine. The coupling may in addition function as a clutch or disconnecting device. Couplings may be mechanical, electrical, hydraulic or pneumatic in operation. It is usual to combine the function of clutch with a coupling and this is not readily possible with the mechanical coupling. A clutch is a device to connect or separate a driving unit from the unit it drives. With two engines connected to a gearbox a clutch enables one or both engines to be run, and facilitates reversing of the engine. The hydraulic or fluid coupling uses oil to connect the driving section or impeller with the driven section or runner . No wear will thus take place between these two, and the clutch operates smoothly. The runner and impeller have pockets that face each other which are filled with oil as they rotate. The engine driven impeller provides kinetic energy to the oil which transmits the drive to the runner. Thrust bearings must be provided on either side of the coupling because of the axial thrust developed by this coupling. A plate-type clutch consists of pressure plates and clutch plates arranged in a clutch spider . A forward and an aft clutch assembly are provided, and an externally mounted selector valve assembly is the control device which hydraulically engages the desired clutch. The forward clutch assembly is made up of the input shaft and the forward clutch spider. The input shaft includes the forward driven gear and, at its extreme end, a hub with the steel pressure plates of the forward clutch assembly spline-connected, i.e. free to slide. Thus when the input shaft turns, the forward driven gear and the forward clutch pressure plates will rotate. The forward clutch plates are positioned between the pressure plates and are spline-connected to the forward clutch spider or housing. This forward clutch spider forms part of the forward pinion assembly which surrounds but does not touch the input shaft. The construction of the reverse clutch spider is similar. Both the forward and reverse pinions are in constant mesh with the output gear wheel which rotates the output shaft. In the neutral position the engine is rotating the input shaft and both driven gear wheels, but not the output shaft. When the clutch selector valve is moved to the ahead position, a piston assembly moves the clutch plates and pressure plates into contact. A friction grip is created between the smooth pressure plate and the clutch plate linings and the forward pinion rotates. The forward pinion drives the output shaft and forward propulsion will occur. 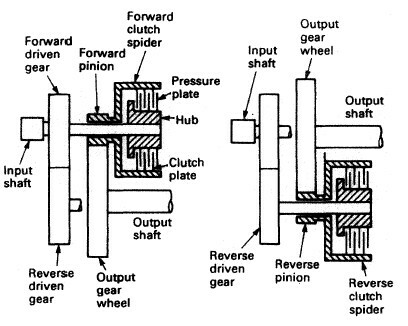 The procedure when the selector valve is moved to the astern position is similar but now the reverse pinion drives the output shaft in the opposite direction. The gearing arrangement used to reduce the medium-speed engine drive down to suitable propeller revolutions is always single reduction and usually single helical. Reduction ratios range from about 2:1 to 4:1 on modern installations. The clearances between the thrust pads and the thrust collar must be checked at intervals not exceeding those recommended by the component manufacturer. Where there are no manufacturer’s instructions this interval should not exceed 12 months, unless instructed otherwise by the management office. The condition of the thrust collar surfaces must also be noted. 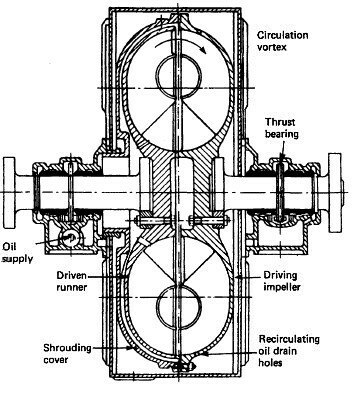 With thrust blocks having a separate lubrication arrangement (i.e. not connected with the main lubrication system) the condition of the oil must be watched and the sump must be cleaned out when any signs of sludge are present. The condition of the cooling coils fitted in the sump must also be checked, and noted. The oil pressure alarms and filters, if any are fitted, must also be kept in good order. The oil in the propeller shaft bearings must be kept in good condition and the cooling water connections kept in good working order. If any of these bearings tend to overheat, a note to this effect should be made in the log book. Main Engine top or side bracing is to be examined at regular intervals and the result of the inspection to be recorded in the Planned Maintenance System. Any damage to the bracing attachment or mechanism is to be reported to the relevant Management Office.